This whole process of creating my seed paper coin pack was pretty amazing. Thrilled to have found out about this company. Really pleased with Custom Earth Promos. Very good customer service. Also, very affordable and 100% eco friendly products. Thanks for helping me find the exact product I was looking for CEP. Great business idea. This whole process of creating my seed paper coin pack was pretty amazing. These coin packs are the best idea! Ordered them from CEP and couldn't be happier! We hand these out at our bank branch customers love the idea! A great gift for those you want to leave a lasting impression on. Thanks for the help Custom Earth Promos! Great color schemes, great creativity options. I also am pleased that I can be very eco-friendly in my purchase. Fair, reasonable company to do bushiness. I received my order earlier than expected, and the finished result was as I'd hoped. Couldn't be happier with the relationship I'm developing with Custom Earth Promos. Great service every time. I own a farm stand and sell these there. People are very intrigued after I explain their potential. We gave these to all the kids to plant. They loved doing it and we were able to express the importance of being Eco-friendly. Very good idea for kids birthday parties, our idea went over very well. How cool!! Lettuce, turnip and carrot seeds!! I can't wait to plant them and see the results. Even the cellphone is bio-degradable. Very nice, earth-friendly concept. A cool, unique idea to bring a "going green" mentality to any forum. A great way to be remembered and be earth-friendly to your peers. 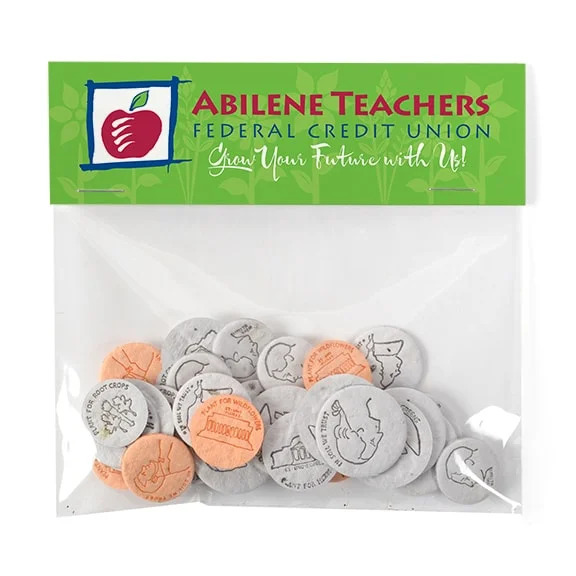 Seed Paper Coin Packs from Custom Earth Promos are an affordable and effective way to further the reach of your ad campaign and establish your eco-friendly brand. Each eco-friendly pack includes a 100% recycled cardstock header with full-bleed, full-color printing included and 20 seed paper coins wrapped in a biodegradable cellophane bag. Seed paper coins are creatively printed with our vintage letterpress machines, embossing images directly onto the premium quality coins. You'll work with a member of our in-house design team to build an exclusive blueprint for your order. We'll create an optimized graphic imprint for the cardstock header and explore potential customizations, such as letterpress printing to render your company logo on the coins instead of the standard currency imprint. The 20 seed paper coins included in our creative packs are each infused with a different seed or seed mixture. Seed coin quarters contain lettuce seeds. The dimes are infused with turnip and carrot seeds. Nickels are embedded with a herb mix of basil, thyme, parsley, chive and oregano seeds and the pennies feature our most popular wildflower blend. We can even customize your coin packs to include custom seed mixes. Your customers will have a colorful variety of herbs, vegetables and flowers reminding them of your eco-friendly brand presence, helping to increase brand loyalty and word-of-mouth advertising. Use these coin packs as a giveaway to increase brand loyalty and attract prospective customers by establishing your brand as eco-friendly. Your custom tailored design of Seed Paper Coin Packs will include 20 seed paper coins, packaged in a biodegradable cellophane wrap and a 100% recycled cardstock header. The seed paper quarters, dimes, nickels, and pennies are letterpress printed with embossed graphics to represent real US currency and each coin is infused with a different variety of herbs, vegetables, grasses or flowers. You can also opt to emboss the seed paper coins with your logo or various custom graphic in lieu of standard currency. The 5" W x 1.5" H imprint area on the recycled cardstock provides ample space to promote your brand name, logo, current ad campaign or eco-friendly initiative. Great for enhancing your eco-friendly presence, seed paper coin gift packs are a highly effective promotional product. 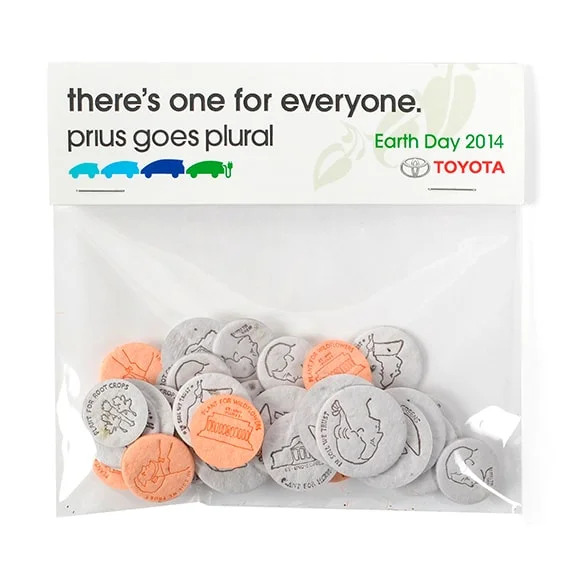 With all-natural construction and complete biodegradability, custom coin packs from Custom Earth Promos are the perfect tool for promoting an eco-friendly initiative of your brand. Market studies are showing increased popularity of "green" brands across the board. Consumers are paying more attention to the social and environmental standards of the brands competing for their business. More than 50% of consumers worldwide report a willingness to pay more for brands who offer sustainable products and practice ethical measures of waste reduction. Build your eco-friendly brand image to secure future success with a custom design order of seed paper packs. A Custom Earth Promos in-house design expert will work with you to build a custom graphic design for the cardstock headers of your coin packs. We will discuss your marketing goals, quantity, time restraints and desired aesthetics to ensure we capture and convey your message with every detail of your design blueprint. Choose to letterpress print your logo or any single color image onto your seed paper coins and customize with any of our 21 seed paper color shades. Only all-natural, soy-based pigments are used to customize our seed paper and an inkjet proprietary spray process ensures that the high germination rate is maintained even after customization. Encourage your customers, prospects or employees to "grow green" with you by planting their seed paper coins. Our seed paper is the best in the industry, with the highest germination rates and exquisite, high-quality texture. We hand make our seed paper in the USA, infusing a carefully selected variety of high germination rate, USDA-approved, non-GMO seeds into a pulp of 100% post-consumer recycled paper. The infused mix is laid out to dry in large sheets at our 30 kW solar power facility and customized with only earth-friendly printing methods and pigments, eliminating eco-impact and empowering our customers to put their "green" foot forward. When moistened and planted under 1/4" of soil, the 20 included seed paper coins are guaranteed to grow into specific varieties of carrots, basil, parsley, wildflowers and more. The foliage that follows will give life to your eco-conscious brand and stand as a testament to your environmental responsibility. 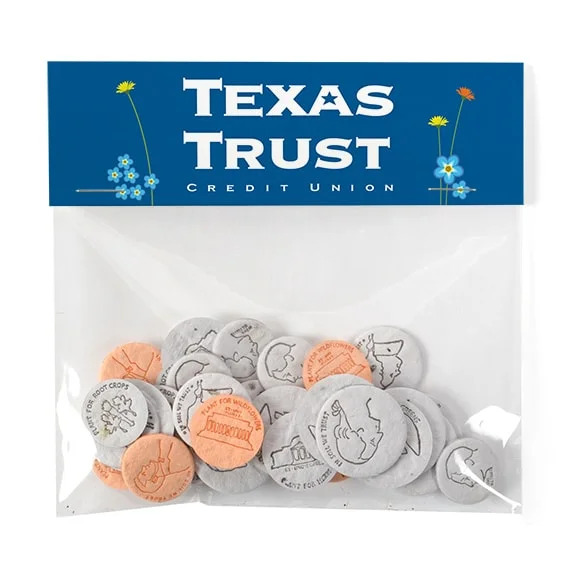 Custom printed Seed Paper Coin Packs are a great branding tool to leave as a party favor of each seat of a corporate holiday party, trade show or special event. Promote your eco-friendly initiative with this interactive handout to engage prospects and turn them into loyal customers. We can even personalize your seed paper coins to be infused with a custom blend of seeds! Just ask your design expert about our seasonal, specialty and custom seed mix options.